BeatrixFan is an English drag queen with an unhealthy obsession with big hair. He has been a forum member for four years and has a special passion for the Duchess of Cornwall. Totally unreciprocated of course. However rehearsed they may seem (and usually are), tributes from politicians are part and parcel of royal departure. Public tributes in the form of condolence books are a recent invention, as are tributes from the royal family, which seem to have become a must after the fury over the Queen's silence after the death of Diana, Princess of Wales, in 1997. In 2002, the Prince of Wales publicly spoke of his darling Aunt (Princess Margaret) and his magical grandmother (the Queen Mother), whilst the Queen has issued several announcements of her “deepest regret” on hearing of the passing of national figures. It’s a huge step up from the time when members of the royal family were not permitted to send flowers to the funerals of commoners (a rule the Queen broke when she sent a wreath to the funeral of Bobo McDonald) let alone attend or give a tribute on television or radio. It is usual for the leaders of all political parties to give some form of public address. This can be a sickly obsequious torch song intended to convince the electorate that though Mr X, MP, bit the head off of a baby last week, the death of a royal has really moved him into changing his infant-nibbling ways. On the other hand, it can be a matter of course and a chore that simply comes with the job. Some politicians hide their left-wing tendencies very well indeed whilst others are obviously screaming “Up the workers” inside whilst giving a stilted eulogy to someone who three weeks ago they declared to be elitist and old fashioned. Then there’s the obituary that later becomes the highlight of a premiership – I refer of course to the “People’s Princess” speech given by Tony Blair and written by spin doctor Alastair Campbell, who found the moniker used in reference to Queen Mary’s mother, Princess Mary Adelaide (fondly known by the British people as Fat Mary), to be the perfect title for Mr Blair to bestow on Diana. The speech (complete with onion-induced tears) captured the mood of the nation but also did much to both save the monarchy and reinforce the image of a caring, of-the-people New Labour government. A royal funeral is always an interesting affair because it's then that the vast international family spawned by Queen Victoria comes together to mourn the latest member of the gang who's glided off to meet his maker. It's quite a chore too, because not only are there the religious differences to take into account, but sashes and hats need to be taken out of mothballs and the usual smiley "and what do you do?" faces have to be replaced with "oh how sad" faces. But every family does it differently, and it starts with the death itself. In Britain, it's the custom to let the body lie in state for at least four days before burial. Even nonstate funerals, like that of Princess Margaret in 2002, saw the coffin allowed to rest in state with constant vigils taking place. It's unknown whether the royal family choose to be embalmed, but it's likely that it happens, considering the length of time they're usually required to wait before going underground. They also seem to favour burial, with the notable exception of Princess Margaret who was cremated, but these days things are a lot quicker. Queen Victoria died on 22 January 1901 but wasn't buried until 4 February, two days after her actual funeral (pictured at left). Of course, not every royal chooses to exit in a flurry of pageantry. Some prefer more intimate services away from the public eye, and indeed it seems to be the fashion among the British royal family to keep things low key if at all possible. When the late Princesses Margaret and Alice died, their funerals were small and, though reported in the usual media outlets, were strictly private affairs. Similarly, when Sir Angus Ogilvy died, his funeral was attended by family and friends only, though his memorial service (which I attended) was a much grander affair with the Kents in attendance as well as the then Camilla Parker-Bowles, just months away from becoming Duchess of Cornwall. Memorial services for royalty are always about saying "thank you," and the many charities Sir Angus had supported were represented as we were treated to a touching account of his life from his son, James. Westminster Abbey was full to bursting and as the mighty thunder of the organ crashed against the braying of the trumpets, and we sang our hearts out in memory of a man who, like his departure from the world, was modest to a fault. For those who like a bit of a knees up, there is the State Funeral. The last to be held in Britain was that of Queen Elizabeth The Queen Mother (pictured at right), and so precise was the planning that the dear lady even asked if she might supply the candlesticks to surround the catafalque as she wasn't all that keen on the ones provided by the Palace of Westminster. A State Funeral is very much a military affair, and every regiment for which the Queen Mother had been Colonel in Chief marched behind the gleaming gun carriage that bore her coffin. The plans for the Queen Mother's funeral (or "Tay Bridge" as they were codified) had been the foundation of the funeral for the late Diana, Princess of Wales, five years earlier. In the hysteria of the moment, the Government and the Royal Household thrashed out ways to make Diana's funeral less grand, and charity representatives rather than military delegations were asked to march behind the coffin. The Queen Mother's funeral was the genuine article, however. With her coffin draped in her Royal Standard and adorned with her crown, the last Empress of India was lamented to her glory by Scottish pipers. Thankfully, the crown stayed put, unlike the cross surmounting the Imperial State Crown at George V's funeral procession, which promptly rolled off and landed in the gutter. A frustrated Edward VIII was heard to declare, "Christ! Whatever next?" Tommy Lascelles suggested that it might have served as a motto for Edward's brief reign as King. Of course there are always royals present, but one country in particular seems to have a way with funerals. The Dutch know how to send their royals off in style and the mourners wear white, a stunning contrast to the majestic beast of a hearse that trundles through the streets with its plumes, horses, and purple velvet. It's a far cry from the departure of the Chinese Emperors. In the last moments of their life, they had a solemn duty to proclaim their successor. Once they'd breathed their last, a very rare and expensive black pearl - sourced years in advance - would be placed in their mouths and their face covered by a white cloth before Tibetan monks flooded the room blowing trumpets and sounding drums to keep the spirit awake as it travelled to its new home. Such a ritual was denied to poor George II, who died on the lavatory. Bottoms up indeed. So what if you were pondering exiting in the style of an Emperor or of a Queen? Well, firstly you must ensure that you've got some kind of bling to display alongside the coffin. A coffin isn't merely a box, it's a display case. For those who are too beautiful to have the lid closed, there is the option of embalming with a viewing. When you do finally allow your flunkies to nail down the top, it must be set off with any medals and orders you may have picked up in your lifetime, a Royal Standard of some description, and a crown for good measure. The coffin must be carried to at least two different locations before it goes groundward, and it must be hauled about on the shoulders of dashing soldiers in scarlet tunics. Your relatives must wear ridiculous hats and march behind you, and the Abbey or Cathedral that has the pleasure of hosting your last rites in this earthly abode should be suitably decorated. No "Mum" or "Lizzie" floral tributes here please. And once you've got the lengthy business of bells and smells out of the way, you can sleep safe in the knowledge that the world shall remember you, helped by the bloody big monument you designed for yourself decades previously, proving that whatever lies on the other side, royalty shall always have the upper hand. Royalty is quite cliquey, and this doesn't end when they're dead. Royals tend to be buried with their kith and kin, and nowhere is this more true than the Royal Burial Ground at Frogmore (pictured at left). From the Connaughts to the Gloucesters to the Windsors, the cemetery there is filled with the finest of the 20th century. 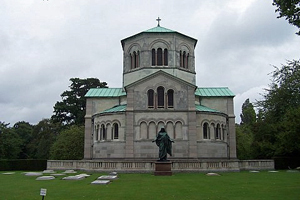 The Duke of Windsor had originally intended that he and the Duchess would be interred in her home town of Baltimore in the United States, but during a visit to Windsor he decided on Frogmore as their final resting place and asked the Queen's permission for them to have their funeral services at St George's Chapel and to be buried at Frogmore. This permission was eventually (although, it is said, reluctantly) forthcoming, and the Duke and Duchess now lie side by side at Frogmore. Just a wander down the track from the Royal Burial Ground leads one to the spectacular mausoleum of Queen Victoria's mother, the Duchess of Kent. This vast edifice is a staggeringly imposing complex designed by A. J. Humbert; when built, it was intended to be used as a summer house as well as tomb, a typical display of the Victorian preoccupation with death. It is rivalled only by the mausoleum of Queen Victoria herself. Queen Victoria couldn't wait to die so that she would be reunited with Prince Albert, and she had her effigy (sculpted in the finest Aberdeen granite) made at the same time as her husband's, to be kept in storage whilst she prepared other plans for making their mausoleum fit for a Queen. As well as taking laborious care over their final resting places, the Victorians adorned themselves with reminders of the deceased. Brooches, pendants, and lockets were stuffed with hair, nails, photographs, ribbons and other accoutrements from the dearly departed. One of the most recent finds was a brooch inlaid with the teeth of a small child, which was auctioned at Sotheby's last May. A popular Victorian hobby was creating books of the dead. These were huge scrapbooks which, among other things, contained photos of embalmed relatives who had been seated and photographed. They served as a catalogue of morbidity which suited the Victorian palate for everything funereal. A visit to Highgate cemetery will confirm the Victorian influence on the ritual of interment. There, the Egyptian-style circles of tombs play host to the grandest in society. Further down the road is Golders Green Crematorium, which has hosted a few royal guests in its time. Princess Louise, Duchess of Argyll, one of Queen Victoria's daughters, was cremated at Golders Green and her ashes interred at Frogmore, whilst King Prajdahipok of Siam was cremated and flown over to Siam to rest in the Chakri Throne Hall in the Grand Palace of Bangkok. In Surrey, an unusual royal is constantly venerated by Russian Orthodox monks at their monastery in the heart of Brookwood Cemetery. King Edward the Martyr was killed in 978 by his stepmother and thrown into the moat by an accomplice; his remains were secretly removed and placed into a special wooden casket. Today, the casket lies next to an icon of the Romanov Family and is venerated by the congregation regularly. Speaking of Romanovs, no final resting place could be more grand than the St Peter and Paul Cathedral in St Petersburg. From Pierre le Grand to St Nicholas the Royal Martyr and Passion Bearer, the Tsars rest in opulent splendour, their most recent companion being the Dowager Empress Marie Feodorovna, who had to wait 78 years to join her husband Alexander III, thanks to a bloody revolution that sealed off Eastern Europe for most of the 20th century. Until her final journey to Russia in 2006, she had rested in the royal burial site in her native Denmark, Roskilde, which is home to such recent favourites as Queen Ingrid, born a Princess of Sweden. It's perhaps hypocritical, but from Boudicca to Grace Kelly, those born or raised to the purple will always see tears from devoted subjects, just as come revolution, civil war or assassination there'll always be one man who calls another man his King. Dandies and the pious both get the half-masted flags, the tributes from politicians and the horse drawn carriage - and really, whether the history books record you as a fabulous addition to cultural affairs or an overspending time-waster, you can be safe in the knowledge that you've lived life to the full. When you're royalty, you really have no other option. All photos on page 1: public domain. 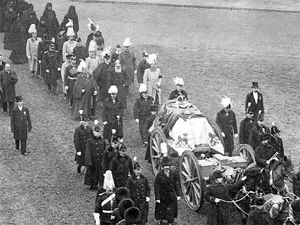 Photo of Queen Victoria's funeral: public domain. 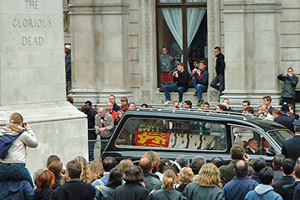 Photo of the Queen Mother's hearse taken by Flickr member AJK Photography and used with permission. Photo of the Royal Burial Ground at Frogmore taken by Flickr member garyshield and used with permission.